Power Edge is an energy drink mix from Sturm Foods (who also make Morning Spark). All flavors have the same caffeine content. The amount shown above is for one sachet (5 grams powder) is mixed with water and makes two 8 ounce servings (containing 80mg per 8 ounce serving). According to the website, Power Edge contains 80 milligrams of caffeine per serving and 100% of vitamins C, B6, and B12 as well as 100% of niacin and pantothenic acid. It's sugar free and only 5 Calories per serving. Power edge is Cheap! This product used to be at Walmart but is now harder to find. It's still for sale online at discountcoffee.com for $12.99 per box of 30. That's just over $.21 for an 8 ounce serving! You can order a case and receive free shipping. The drinks are sweetened with aspartame and Ace-K.
Power Edge is suitable for healthy adults only. (Atomic Punch ) Citric Acid, Taurine, Malic Acid, Natural and Artificial Flavors, Maltodextrin, Panax Ginseng, Guarana, Potassium Citrate, Salt, Caffeine, Ascorbic Acid, Caramel Color, Aspartame, Sodium Citrate, Inositol, Acesulfame Potassium, Niacinamide, Silicon Dioxide, Pantothenic Acid, Yellow 5, Vitamin B6, Vitamin B12, Blue 1. How Does Power Edge Energy Drink Mix Compare? 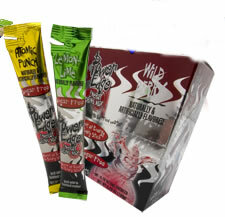 Power Edge Energy Drink Mix contains 10.00 mgs of caffeine per fluid ounce (33.81mg/100 ml).